Our island is most famous for the existence of the Chincoteague Pony. This breed developed and now lives in a feral condition on Chincoteague Island. Popularized in 1947, the breed was made famous for its inclusion in the Mist of Chincoteague series written by Marguerite Henry. As mentioned in our opening page, the Chincoteague Pony holds a mythic status within island culture. The most popular legend posits that these ponies are descendants of shipwrecked Spaniards, but it is more likely that they descend from stock released on the island by 17th-century colonists wanting to escape livestock laws and taxes on mainland America. The feral ponies live on both Chincoteague and Assateague islands, though a fence divides the island along the Maryland/Virginia state line. Around 150 ponies live on each side of the fence. The Virginia ponies are treated twice each year for veterinary inspections. Though phenotypically horses, these animals are referred to as ponies because of their tiny size—at just 13.2 hands, they stand at 54 inches tall. Visitors can witness ponies in all solid colors, as well as in pinto patterns. If you want to glimpse one of these magnificent, adorable animals, visit any of our islands’ (both Chincoteague and Assateague) marshes, grass fields, or beaches. 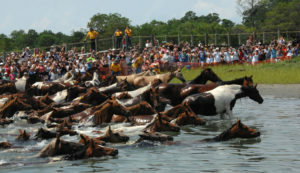 CHINCOTEAGUE, Va. – (July 25, 2007) The 82nd Annual Chincoteague Pony Swim with more than 200 wild ponies swimming across the Assateague Channel into Chincoteague. U.S. Coast Guard photo by PA2 Christopher Evanson. I thought most of the ponies were on Assateague…? Forget the island history—the Chincoteague pony is hands-down the best part of this place. They’re SO cute. Don’t get too close to them, though—they can be either really skiddish or really aggressive, depending on the pony.